This sense of reduced scale is felt all throughout the game. While I spent days upon days with The Sims 3 and found myself constantly surprised and endeared, it took a handful of hours before I couldn't stand the thought of opening The Sims 4 to watch my Sim eat, sleep, and work, with very little to shock or delight me in between. The new emotions that Sims can feel are cute at first, but one soon cycles through them all, and you're just left with a staler, minimized version of everything The Sims 3 did. Without the wealth of interactive objects we'd gotten used to in previous installments, one is often at a loss to do much but repeat the same tedious routines, and more often than not I simply sped the game up and let my Sim behave with complete autonomy. There just isn't a lot in it for me to get much more invested than that. It doesn't help that the game is pretty damn buggy. My main Sim's last status was that of a man with a frying pan perpetually glued to his hand, and I've also lost considerable amounts of progress thanks to a number of hard crashes. It's not the buggiest game I've ever seen, or even the buggiest game Electronic Arts has ever had the nerve to release, but it's annoying nonetheless - especially since glitches like my Sim's frying pan are reported to have appeared in the last game too! Visually, the game looks enhanced from the last outing, but not dramatically so. The titular Sims have more vibrant animations, appearing much more alive whether taking selfies or getting into fights with idiots. The silly music and nonsensical Simlish voice acting are out in full force, which is at least pleasant. 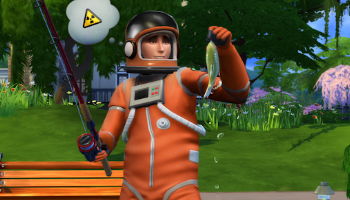 The Sims 4 isn't bad, exactly, it just sure as hell isn't particularly good. In cutting out the fluff and focusing on the core gameplay, EA Maxis has forgotten that fans LIKED the fluff, and the core gameplay was simply a conduit to obtain all the distracting nonsense and silly toys. Call me cynical, but it seems to me that this fourth installment will become a conduit for all that ... we'll just be expected to pay more to get it. By far this game's biggest crime? It's boring, and The Sims should never be boring. Existing as merely a shell compared to the experience we've gotten used to over the years, a husk when put up against the kind of content we know exists and know will be sold to us at a later date, there's just not enough meat on the bones to make The Sims 4 a worthy successor to its predecessor. All it did was make me want to go back and play the last game in the series, and that's really not a good thing. Also, my GOD, the tutorial messages that never end. On and on. Harassed by a videogame. Like there's not enough of THAT online. Bottom Line: The Sims 4 is basically The Sims 3, but shrunken and sterile. While some tweaks and enhancements are nice, none of them can offset the overall lack of engagement provided, and the looming promise of DLC is no compromise.